Waste crime damages and destroys. I’ve seen the effects up and down the country. If you’ve ever lived near an illegal waste site, I don’t need to remind you how horrendous an experience it is. They affect people’s health, wellbeing and quality of life. They’re unsightly and smelly but more importantly, they endanger the environment and can put lives at risk. The pollution they emit gets into the air, the soil and local streams and rivers, poisoning the environment. Illegal sites have a curious habit of catching fire, particularly when it suits the criminals running them: the fires and smoke can close motorways, railways and airports. Waste crime is also a drain on the economy – up to £1 billion a year. It hurts legitimate business, because waste criminals undercut all the law-abiding waste companies. It cheats the taxpayer of money which should be paying for public services. And it costs millions of pounds to clear up the mess the criminals leave behind. Serious and organised criminal activity is a growing problem. Perpetuators act illegally to evade landfill tax and undercut legitimate businesses and they’re not afraid to employ violent tactics whenever they deem necessary. They may also use waste management activities as a cover for illegal activities including human slavery, money laundering and drug trafficking. The Secretary of State has commissioned a review into organised criminality in the waste sector. The review will help us understand the scale and impact of serious and organised crime, and look at the powers and capacity of the Environment Agency and other bodies to tackle it. Find and close down illegal waste sites. 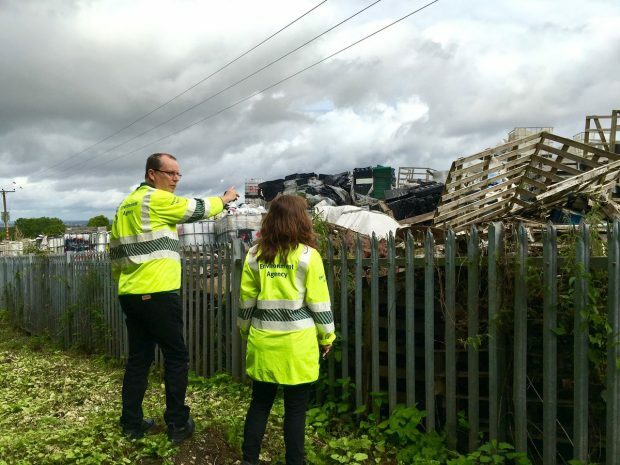 We shut down two illegal waste sites every day: over 800 last year. Prosecute serious offenders. The courts are now imposing stronger penalties for waste crime – larger fines and jail sentences. We welcome this. Go after the waste criminals. We have a specialist crime unit using intelligence and sophisticated technology to track and disrupt the organised crime gangs involved. Seize criminals’ assets, including their houses, cars and money. The Proceeds of Crime Act allows us to confiscate the proceeds of waste crime after a conviction. A proportion of the amount confiscated comes to the Environment Agency which we put back into fighting waste crime. Regulate waste sites. You need a permit from the EA to operate one. If you don’t have a permit, or are not complying with it, we will take action against you up to and including closing your site down. Collaborate. Work with the police, local authorities, HMRC and legitimate waste companies to pursue the criminals and bring them to justice. Are ambitious. The government’s new 25 Year Environment Plan sets a target of eliminating waste crime and illegal waste sites completely by 2043. We are getting strong support from the government in this fight. The government is providing an extra £30 million over the next four years to help us tackle waste crime, has given us stronger powers to tackle the criminals, and is proposing to give us more. The new powers allow us to block access to problem waste sites to prevent thousands of tonnes of waste building up illegally; and to force operators to clear completely the site of an illegal waste dump. The proposed additional powers will make it harder for waste criminals to get into the waste business in the first place, by making it harder for them to get a licence to operate". It’s not just our job to address waste crime, everyone has a role to play in tackling waste crime. If you see it, please report it to us on 0800 555 111.